Founder of the popular Ponzi Scheme, Sergei Mavrodi a Russian businessman whose pyramid scheme known as MMM extorted the life savings of millions of Russians in the 1990s and also millions of Nigerians about two years back, has died of a heart attack, according to Russia media. It was reportedly said the 62 years old Sergei Mavrodi was rushed late at night to the hospital on March 25 with serious pain in his chest and he later gave up and died several hours afterwards. He's popular financial Ponzi Scheme operated as pyramid in which earlier investors made and received profit from the new/subsequent investors. The scheme promised profit return of about 20% to 75% per month and also lotteries/bonuses for faithful and dedicated investors. At the moment it became difficult to get new clients/investors, the Ponzi scheme collapsed leading to a huge financial loss for over 10 million people, which left some destitute. 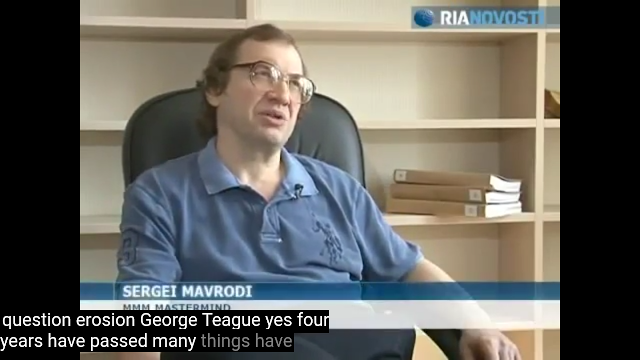 Sergei Mavrodi was elected a lawmaker in 1994, the act which he later revealed was to ensure he received immunity from prosecution. But two years later, in 1996 he lost his parliamentary mandate. He was found guilty of financial fraud by a Moscow court in 2007 and sentenced to 4½ years in a penal colony. Briefly after his serving term, in 2011 Sergei Mavrodi launched another pyramid scheme called MMM-2011, and he called on investors to purchase his new so called Mavro currency units in a proposed bid to get rid of the UNFAIR financial scheme. He halted the scheme some 15 months later. From the year 2011 to 2016, Mavrodi relaunched the Ponzi scheme under the MMM brand in India, Nigeria, China, South Africa and Zimbabwe. Making it and the site country specific. But in many of those countries especially Nigeria, Mavrodi's Ponzi scheme operations were suspended severally due to government intervention and subsequently shut down.